What do you do when you notice your kids’ neighborhood friends don’t seem college bound; should you change schools to find a more college-friendly peer group? What about when you suspect your ADD son isn’t producing high quality homework? Should you monitor it more closely? Question #1 – We live in a nice neighborhood that is economically diverse. As our boys are getting older we are noticing that a lot of neighbors don’t share our values for highr education and we are worried the high school our boys will attend does not have a large college-bound population. Do we need to plan for private school? Do we need to move? Is there an in-between option? We’ve heard some parents talk about getting their kids into some of the “desirable” high schools by using a relative’s address or rental property / business address. We want our boys to enter secondary school with a peer group that motivates and encourages them and we just don’t think that is going to happen at our neighborhood school. What do we need to do to put college as a priority? 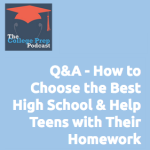 Question #2 – I’m always concerned that my son (who is a freshman in high school with ADD) is not doing his homework or doing it correctly, but he doesn’t want me to check it. Do you have any suggestions?